Update – 20120712: I was wrong, this is still a great article, but I gave up on Intuit and any and all of their Macintosh software, see my latest post here. As I mentioned in my last article, iBank – Your Quicken Alternative, I’ve entered my last transaction into Quicken 2007 for Mac. I haven’t deleted it off of my system yet, but I will shortly. This is my review of Quicken Essentials for Mac (QEM as as my fellow bloggers seem to have dubbed it, I don’t think that rolls of the tongue, so I’ll just use Quicken Essentials). This article will be the culmination of my adventure into Macintosh personal finance software. I didn’t set out to be a spokesperson for the legacy Quicken for Mac users, but it seems to have worked out that way, at least a little, and I’m awed at the passion people have for this space and the wonderful comments everyone has left on my blog. Thank you. When I setup this site, it was to communicate a security flaw I discovered in the Pogoplug home NAS device. I was upset, disgruntled, and needed an outlet. As soon as I published that article, I happened to get my Quicken Essentials pre-order email from Inuit. I immediately became livid at what I perceived to be a complete and total betrayal of the loyalty, patience, and trust I had provided to Intuit. Not only was the new product missing key features, that were present in my 4 year-old version of Quicken, but there was no upgrade pricing, and only a moderate discount for pre-ordering ($10). 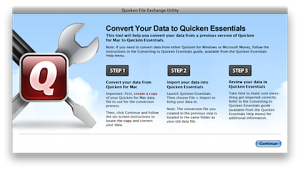 That prompted me to write my second ever blog post, Quicken Essentials 2010 for Mac. Why Bother? The rest was history and led me to talking with multiple people at Intuit, including a discussion with Aaron Patzer, VP/GM of Personal Finance at Intuit, and having discussions with folks at IGG Software, the developers of iBank. I hope that after you’ve read this review, you can truly make an informed decision on your next Personal Finance software purchase for the Macintosh. It’s not an easy place to be right now if you rely on this type of software. No matter what you choose, you’re going to be faced with data conversions, data irregularities, new interfaces, different problems from the ones you’ve already discovered work-arounds for, and learning curves. Hopefully I’ve helped you along that path. Once you’ve acquired your Quicken Essentials disk image (or CD-ROM) and opened it, you’ll find three items of importance: Quicken Essentials, the Getting Started guide, and the Converting? folder. 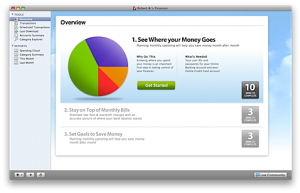 If you are new to Personal Finance software you can just drag the Quicken Essentials program icon into the provided Applications folder link (hint, hint, iBank) and it will copy itself into the Applications folder on your hard drive. The Getting Started guide, a PDF, is well worth the time it takes to read through, it is very well written, thorough, and gives you a great starting point for Quicken Essentials. I highly recommend both new and old Quicken users read it. Yay! Intel native! Boo, not 64-bit. I know, I’m never happy. Bye bye Rosetta. Alas Intuit does not provide demos of its products. It would be great if existing Quicken for Mac users could pull this version down and try it out. I know the Beta tests were, for the most part, open and lots of people got to use it, but this is the finished, polished, product. A timed demo or even transactional limit demo (like iBank) would probably waylay the concerns of many existing Quicken customers as they moved to this product. It would have also given folks a chance to test out the data conversion and see what, if any, issues they’d have when moving, before they purchased. Unfortunately, most “mainstream” software does not provide a demo period, so I’m not going to fault them for it. Yea, you actually have to do some work BEFORE you can import your data into Quicken Essentials. You’ll have to convert your existing data file into something more modern that Quicken Essentials can read. You didn’t expect Intuit to natively support a four year-old application data format did you? What I don’t understand though is why not do this from within Quicken Essentials? I really don’t get the thought process behind this. As a programmer, I can certainly respect that this is a one-time action you’re going to perform on your data, so why bloat the application with all the code necessary to perform those conversions? Well, because it’s not necessarily a one-time thing, that’s why. The issue here is that if you misplace, damage, or lose your original installation media, then you’ve lost the Utility and cannot convert older Quicken files to the new format anymore and hence cannot import them into Quicken Essentials. This could have been handled better. Worst case, keep this application separate, but bundle it inside the main application and have it launched from within Quicken Essentials itself. This is clunky. I don’t like it. Regardless of its clunkiness, you should back up your Quicken Data file. I’m going to say it again, BACK UP YOUR ORIGINAL QUICKEN DATA FILE. The easiest way is to highlight it, press CMD-D to make a copy, and then perform all of the conversion operations on the copy. After you’ve got a backup, run the Quicken File Exchange Utility that is found in the Converting? folder on your installation media. Yep Intuit told you to make a copy too, I was just prepping you. Tap the Continue button and the utility will ask you to find your Quicken Data file. Go ahead and Open the COPY that you created above. This process is quick, took about 2 minutes on my 13MB Quicken Data file. When it’s complete, you can delete the copy you made of your original data file. You’ll now have a new file in the same directory as your Quicken Data file, but this one will have “export.qdfx” appended to its name. This is your new-fangled Quicken Essentials format data file, which you can now import into Quicken. You can finally fire up the Quicken Essentials application. You’ve converted your data to a more modern format and now you won’t have to bounce in and out of Quicken to get your data imported. I’ve got to hand it to Intuit here, its pretty. This is nothing like Quicken Financial Life’s Beta Screens. That’s a clean initial screen, looks very Mac-like, and the colors there draw you in and make you want to jump in with both feet and start using it (I want a chart like that!). You have Overviews, Transactions, Scheduled Transactions, Downloads, Summaries, and Spending Cloud reports. What else could you possibly want? Oh yea, your Accounts. So, pull yourself away from clicking all the buttons, reports, and immediately exploring the new application. Let’s get your Accounts loaded up. This is where the rubber meets the road. We’ve been promised by Intuit, and Aaron Patzer, that this is one of the areas that Quicken Essentials will shine. This is where you experience “The Mother of All Converters”. This bad boy is supposed to take any legacy Quicken data file, and other application data files, and perform magic on it, importing all of your supported (yes, I said supported, not all) data into your new Quicken Essentials application. So let’s get started. If you haven’t already stopped reading at this point, then it’s time to move forward and perform the import. Head to the File menu and select the Import menu item. Again, seriously Intuit, this process couldn’t have included converting the Mac file to the proper format first? I mean there is a Convert menu with a Quicken Mac File… submenu, but it apparently doesn’t do anything, as the instructions ignore it, and if you try to use it, all your Quicken Data files on the disk (both old and new) will be grayed out, not sure why this menu is there. Okay, go find your modern Quicken Data file that you created above, and Open it. Now go to bed. Or go to a movie. Have a date night. I’m serious. This process takes eons. I thought the iBank import process took a long time, it’s NOTHING compared to the time Quicken Essentials takes to import your data. The battery on my MacBook Pro died, this is the one with the 8-hour battery (okay I’m joking here). My data file took 28 minutes to completely import. That’s three times the length it took iBank to import the same file. However, the best thing about the conversion process, if you’re patient enough to watch it, is that there is extremely good feedback on what it’s doing, what account is being imported, and you’ll immediately start seeing the on-screen charts updating as transactions are brought “live” into the application. You’ll even see what appears to be EVERY transaction flying into the new Quicken. It was entertaining. Something else that Intuit does for the import process, that I wish iBank had done, was provide an extremely detailed log of the entire process. You can see everything it did, and that file will be placed on your Desktop. If you have questions about the import process for your accounts, check this file first. After correcting these items, the account balanced again. This was a much better result than iBank had delivered on my data. But that better performance comes at a price. My eight Brokerage accounts came across without any transactions and as having a zero balance. If I want to see how much money I had/have in these accounts, I have to set them up for online access. Just one problem with that, 5 of those accounts were closed, so all that history is gone. Was I using that history? Not really, but it still stings to lose it all. Additionally, something I wasn’t expecting happened. Both of my active 401-K accounts were wiped of history as none of the transactions came across. I use these accounts to track my contributions to my 401-K (and my wife’s), using a Split transaction on our Paychecks that puts money into those accounts. This probably isn’t the traditional way people used the 401-K account type in Quicken for Mac, but it’s how I was using it, and it worked. What is really throwing me is that I can use the 401-K account I have setup as the destination of a transfer, but it doesn’t show up in the account, it seems to just disappear. Very disconcerting. Any errors in the import process should be logged in the Import Log that’s created on your Desktop, after checking my log I found the following note (see above): “1 transfer transactions in the account ‘AT&T Universal’ have been marked with the note ‘[IMPORTED ORPHAN TRANSFER]’ because they could not be matched. These transactions may appear twice in the imported data.” I also found another note: “Data Validation Error – The amount specified for the transaction is not equal to the sum of the amounts specified for the detail lines.” I think that was my missing transaction, because when I reviewed it, there was an amount that hadn’t been assigned any kind of Category and required me to enter it manually. Conclusion: Quicken Essential’s “Mother of All Converters” delivered. Everything came across, that was supposed to, and the errors for those accounts were minimal. All of the errors I experienced were logged in the Import Log, which is the good news. The bad news was that Intuit should have provided a Transaction Date for the items logged in the Import Log, that would have made it MUCH easier to locate and correct following the import. This is a Macintosh application. There’s no doubt about it. It just feels like the application was written by Apple and that says a lot for the effort that Intuit put into this application. Everything lines up on the left, the different view panes are adjustable, and you perform various filtering capabilities at the top of each window. Additionally, the interface is responsive. I didn’t see a beach ball the entire time I was moving around the application. In a departure for Quicken, the familiar two-row transaction is gone. All transactions are presented in a single line (more below). 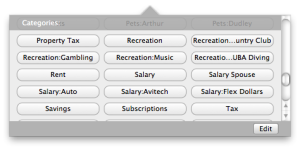 As an improvement over previous Quicken for Mac products, the columns are completely adjustable. Don’t like the Notes column at the end, just drag it to where you want it to be (I moved mine next to Category). However, these settings appear to be per account, so you have to keep doing it on every Register. There are many, many, columns you can add to the Register view, just right-click on a blank column and select the data elements you’d like to see (or you’d like to remove) from view. One gripe I have with entering transactions in the register is choosing Categories. I got very used to using Quicken for Mac with a keyboard and typing out the first few characters of my Category, Quicken 2007 for Mac would autofill these for me while I was typing (so does Quicken Essentials), but where this application is different is sub-categories. 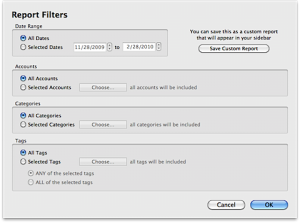 Quicken 2007 for Mac would let me hit a colon (:) at anytime during entry, and it would autofill what it recognized and then immediately start autofilling the sub-category. Quicken Essentials doesn’t understand this mode of operation, puts the colon into the Category field, which immediately unmatches your category. It’s annoying. However, there is a new Category picker (which for some reason is called a Register List Picker) that is on by default (and can be disabled from the View menu). Overall, Quicken Essentials does a nice job with the Register. It has a similar feel to the Quicken 2007 for Mac Register, with some very welcome improvements. The small learning curves getting used to the new features are just those, learning curves, after a few transactions have been entered, you’ll like the overall interface. This is where you’re going to spend the bulk of your time with Quicken, adding Transactions. You’ll either be typing them in manually or using the Online features to have Quicken download and insert them. The manual entering of transactions has been changed from what you’re probably used to, which has both good and bad points. Like in iBank, our familiar empty transaction is gone, you now have to click the New Transaction button, or use CMD-N. This isn’t as convenient as just having a blank transaction you fill out, but it works fine. I also noted that the entering of transactions isn’t as crisp as it was in Quicken 2007 for Mac, there are delays, especially noticable with the date picker, which I never use, but which pops up all the time, but these delays are very tolerable and shouldn’t detract from using Quicken. I spent about an hour and entered around 50+ transactions into various accounts. It worked well, other than the slight delay I experienced while moving between fields. I entered a transaction into the wrong account, and went to find my Move Transaction menu item, it was gone, which sucked. However, I then had a stroke of insight and tried the “Mac Thing” to do, just pick it up and drag it to the right account. Guess what? It worked exactly like it should! Now that’s a Mac app! Transaction entry works at least as well as it did under Quicken 2007 for Mac, the biggest issue I have is that Intuit changed how Transfers work (actually creating a Transfer action) which means you don’t use Categories that represent your accounts any longer, that means on those transfers, the Category is blank, and I found I constantly added Categories to the Transfer, which is inaccurate now. It’ll take some time to retrain myself. This is the other way you’ll be entering transactions into Quicken Essentials. Since my brokerage accounts all had zero balances, I decided to try setting them up first, to get a feel for this aspect of Quicken. I successfully setup E*Trade and Merrill Lynch accounts without incident. However, ING Direct cannot be setup, you must download the transactions and import them manually into Quicken, iBank had the same issue. I’ve read this as a complaint of iBank, but it appears the issue is ING Direct, as both applications have the same issue. Shame on ING. I then setup several of my other accounts for online access, this process included setting up accounts that I’ve never had online access to before, like PayPal. The process worked well, but wasn’t perfect. For example, when setting up my USAA Checking account, it wouldn’t take my information, claiming it wasn’t correct. I verified it by accessing the USAA website directly, Intuit kindly provided me a direct link to the website and asked me to verify my information. I’m convinced that the issue was the symbol characters I use in my passwords (I make use of them frequently). If that’s the case, it’s a bug, as Quicken needs to support whatever characters my online access supports. I’m a HUGE fan of 1Password on the Macintosh (if you haven’t tried it out, you need to, it will probably be my next software review) and all of my online accounts use extremely strong passwords, that are all different from each other, hence the heavy reliance on symbol characters. After changing my password at USAA to something less secure than it was, I was able to access my account, proving this is a bug in Quicken Essentials, which needs to be addressed by Intuit. Additionally, I found some of the accounts that are listed in the Financial Institutions list, really aren’t available. Just like in iBank, you’ll have to manually download a file from the Financial Institution and then import it into Quicken. ING Direct, as mentioned above, was one of these. I’m pleased with the Online Access. Based on experience with Mint.com I was expecting Quicken Essentials to shine in this area, and it does, supporting a truly huge number of Financial Institutions. You can one-click update all of your online accounts, or do them individually. The only shortcoming (besides the bug I found) is that you cannot setup a schedule. It would be really great if you could set it up to automatically update every time you opened Quicken, every time you closed it, or in some type of a background process that could be scheduled outside of the application. However, one-click updating is probably sufficient for most people, including me. This is another strong area for Quicken Essentials and one of the primary reasons we take the time to use personal finance software. Categories are essentially unchanged in this version, with the Register List Picker being the only new item. All of your custom categories will be imported into Quicken during your data import process. This is a great time to clean up those categories, I’ve had several misspelled or duplicate categories for a long time. I spent a bit of time going through them all and renaming the bad ones to existing ones. Quicken Essentials will prompt you that a category already exists by that name and ask if you’d like to merge them. That rocked. Intuit has taken the previous concept of Classes and Web 2.0ized them into Tags. Why do you care? Because Tags rule! Seriously though, through the use of Tags you can essentially create a bunch of “sub-categories” for your transactions. When you eat out, you probably always categorize them as Dining. But what if that dinner was with a client? Isn’t that tax deductible? But all your Dining isn’t, right? So you use a Tag: Business Expense. Now you can run a report on all transactions marked “Business Expense”. These can include transactions from a bunch of Categories. I never used Classes under Quicken 2007 for Mac, I never really understood what they were for! They were always Tags. I’m loving them! Pulling them out of the Category means your data will export and import more efficiently to other applications. This is the single biggest weakness for Quicken Essentials, for me. I so miss using PocketQuicken. I was thrilled with iBank’s iPhone (iTunes Link) application and really wish Intuit would also put out a Quicken iPhone application. Yea, they have a free Quicken Online iPhone application (iTunes Link), but it won’t link to your data in Quicken Essentials at this time. Perhaps, if Aaron Patzer gets his wish, you’ll be able to link your Quicken Essentials data to a Quicken Online account and then use this application to make changes and updates to it. Maybe not. I hope they do. Why do you spend all your time Categorizing transactions? Adding Tags to transactions? So you can write and view reports of course! This, also, is an area where Quicken Essentials should shine. It took me a bit to figure out how to create custom reports. The Help System doesn’t even have a match on the word “Report”. If you look carefully in the upper-right corner of either the Spending Cloud or the Category Summary report, you’ll find a small Settings button. That button will bring up the above screen (if you clicked the Category Summary report). Here you can customize the settings of that report, then save your customizations as a new report that will show up under the Reports section in the sidebar. I wish I could tell you I was impressed, I wasn’t. This area of Quicken Essentials needs a LOT of work. 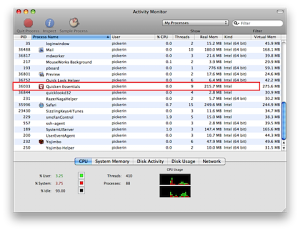 You really cannot setup anywhere near the reporting environment that Quicken 2007 for Mac provided. The reports here are pretty, but they’re redundant, they’re all Category summaries, just different ways of looking at them. Something I used constantly under Quicken 2007 for Mac was searching ALL of my Registers for a specific transaction, usually based on Memo fields. I’m still looking for how to do this in Quicken Essentials, I can’t find it. This is probably the single largest failing of Quicken Essentials in my opinion. Quicken Essentials has a lot going for it. As I was writing my two review articles, I stopped entering any transactions into Quicken 2007 for Mac. I was serious when I wrote that I had entered my last transaction into that application. Because of my hiatus, I had accumulated a backlog of transactions to enter into…something. As my wife will attest, going several weeks without entering transactions…somewhere, is a long time for me. I even worked out a system where she can take a photo of a receipt, drop it in our Dropbox, and then it will automatically import into Yojimbo so I know to enter it into…something. I resisted entering all of those transactions into iBank, because if I ended up going with Quicken Essentials, I didn’t want to duplicate that work. I entered enough into iBank during the review to get a feel for how well it worked, but I never entered the full backlog. Then while working with Quicken Essentials I found myself entering not only the transactions I needed to enter for the review, but my entire backlog. Here’s the thing about Quicken Essentials: it just feels familiar. I’ve been entering transactions into Quicken for over a decade. It just feels right to be putting them into Quicken. I really enjoyed using iBank, but it never gave me that same sense of familiarity. Also, it was slow. But, ultimately, it was this issue of doing what I’ve always done: enter the transactions into Quicken. Then you need to purchase iBank. At this point, you need to be very honest with yourself. 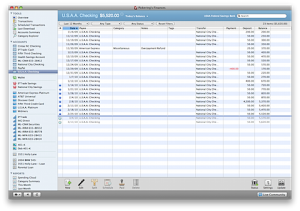 You need to take a hard look at how you’re using Quicken 2007 for Mac. What are the things you’re doing every day? What can you live without? I’m upset that Intuit released a product for Macintosh users that didn’t provide, at a minimum, the same features that were present in the previous version. However, it’s very, very usable. In fact, it’s good. The software is far from perfect, but I believe throughout this article I’ve pointed out the failings I’ve found. Some will be fixed in future updates, I’m sure. Others will take new versions to correct, and Aaron Patzer mentioned “additional SKUs”. Yes, that probably means “Deluxe” and “Premier” and “Home and Business” versions for additional fees, but that’s how software publishing works. Then you need to purchase Quicken Essentials. I wish I could have given a straightforward recommendation, but it’s a complex set of criteria when recommending a software application with such a wide variety of features and needs. I’m personally going to be using Quicken Essentials; though if iBank performed better I may have gone the other way, for me, the speed issues made it a clear decision. I want to take a moment to congratulate Intuit. As I did my review of Quicken Essentials, everywhere I looked, Intuit was telling us what Quicken Essentials didn’t include. It’s in all of the documentation, it’s on their website, it’s in the instructions for importing data, Aaron Patzer mentioned them to me on the phone, and their PR people even took time to point them out to me, rather than pointing out features. That’s an amazingly transparent way to handle this type of transition and I wanted to personally applaud Intuit for taking this stance with Quicken Essentials. They could have opted to hide or downplay these issues, but they chose to embrace them. They deserve credit for that, if nothing else. 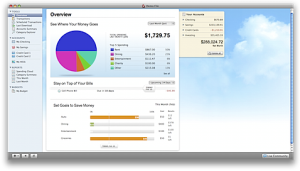 Note: During the writing of this review, Intuit released a Quicken Essentials for Mac upgrade. The current version is now 1.1f4438, the patch contained multiple bug fixes, though my bug was not fixed. Walt Mossberg did a review of Quicken Essentials 2010 for Mac on the All Things Digital: It was pretty high level. He didn’t seem fond of it. TUAW has also done a review of Quicken Essentials for Mac and they also interviewed Aaron Patzer at Intuit. Both are worthy of a read. Someone posted in the comments, and I have confirmed, a serious issue. I’m pretty big on security and I took the time to point out that Quicken Essentials would not allow you to password protect your data file. Well, there’s another, pretty big, security issue with the application that I felt I should point out to my readers. Quicken Essentials DOES NOT STORE PASSWORDS LOCALLY. This is just about a deal-breaker for me. In order to use any of the online account features, you must enter your username and password. No problem if you’re using Quicken 2007 for Mac, which had something called a “PIN Vault”. Under that application, your usernames and passwords were stored locally and protected by a PIN that would allow you to just remember it. However, Quicken Essentials takes it a step further, a step too far in my opinion. Your usernames and passwords are stored on the Quicken Online servers and accessed whenever you update your online accounts. Worse, you don’t have an alternative to storing them on their servers. Quicken Essentials does not provide the ability to force the application to prompt you for them, it’s all or nothing. My suggestion: If you trust storing your website usernames and passwords in your browsers, then this method Intuit has chosen to use is probably just as secure. If however, like me, you do not, then you should write-off all of Quicken Essential’s online access capabilities, as they are completely and totally worthless.